A Bangkok river cruise on the Chao Phraya River gives the visitor an overview of the legacies on this river of kings. The historical monuments, grand palaces, temples and various communities on the riverbanks present a historical insight into the city and also a picture of stark contrasts. It needn't have to be an elaborate affair; you can cut the frills and expenses.Plan the river cruise yourself for a more meaningful Bangkok sightseeing tour from the Chao Phraya River. At 370 km, the Chao Phraya River is the longest river in Thailand. It's headwaters start in Nakhon Sawan, more than 200 km north of Bangkok. The river continues past Bangkok to Samut Prakan and flows into the Gulf of Thailand to the south. Start the Bangkok river cruise from the Sathorn Pier near the Taksin Bridge; five minutes walk from the S6 Saphan Taksin skytrain station. 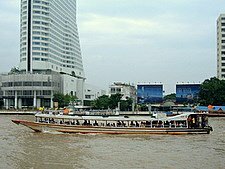 The first recommended stopover, in our Bangkok river cruise, is the Ratchawong Pier, which leads to Yaowarat Chinatown, Soi Sampheng where Chinatown started and Soi Sun Yat Sen named after Dr Sun Yat Sen, the father of the Chinese Revolution. One of the most attractive periods to visit is during the Loy Krathong Festival when the Chao Phraya is transformed into a river of lights by floral floats lit with candles. 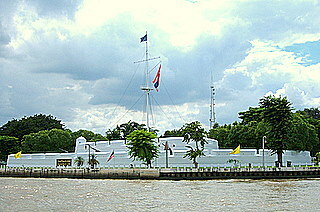 Further upriver on the Thonburi bank, near the mouth of the Bangkok Yai Canal, the white ramparts of Fort Vichai Prasit come into view. This was an old Ayutthaya fort built in 1688. King Taksin's Palace was in this complex that's now the Royal Thai Navy HQ. A canal was built in 1542 to straighten out this long meander and shorten the sailing time to Ayutthaya, the old capital. 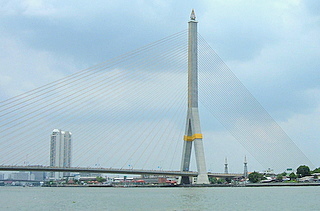 The new canal subsequently became the present course of the Chao Phraya River. Our Bangkok river cruise will now pass the most majestic sight along the Chao Phraya River, the Grand Palace and the Temple of the Emerald Buddha in old Rattanakosin, the historical center, which is the origin of modern Bangkok. The Thonburi bank, across from the Grand Palace, is where old communities have lived long before Bangkok was established as the capital. The Bangkok Noi Museum, further inland, preserves the history of these communities. The Royal Barge Museum, where the famous barges for the Royal Barge Procession are displayed, is located in the Bangkok Noi Canal near the Phra Pin Klao Bridge. 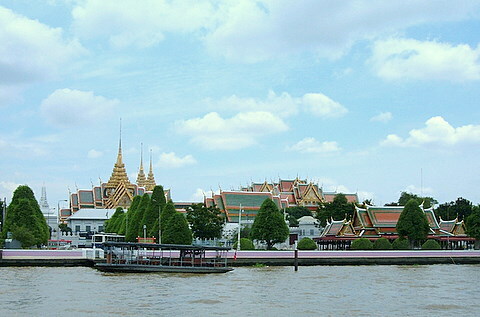 The Bangkok river cruise next passes Fort Phra Sumen, built in 1783 to fortify the old city. Located near the mouth of the Banglampoo Canal, the second protective canal ring, it's one of the two remaining forts left from the Bangkok era. The most spectacular bridge across the Chao Phraya River encountered in our Bangkok river cruise is the King Rama VIII Bridge, a suspension bridge that stands out like a giant harp over the water. 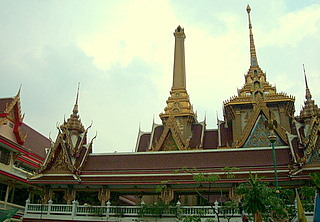 Bang Khun Phrom Palace, which houses the Bank of Thailand Museum, is nearby. Bridges across the Chao Phraya River serve as useful landmarks in this river cruise. Some piers, located near these bridges, are named after them. You'll pass under eight bridges in the entire river cruise. Further upriver life gets less touristy and more rustic, particularly on the Thonburi bank. Many piers are named after wats (temples) located nearby, around which community life is built. Some of these temples, though less well known, are equally beautiful as their city counterparts. Wat Soi Thong and its pier is one example. Chao Phraya River boats ply along the river during the day stopping at regular piers.These boats are an inexpensive and convenient way for a Bangkok sightseeing tour of the river. 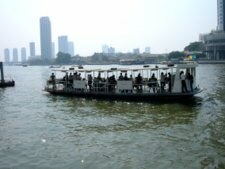 A Chao Phraya River tourist boat service is also available for a day tour of selected historical areas and piers. Boat rental services are also available for groups of 20 or more. 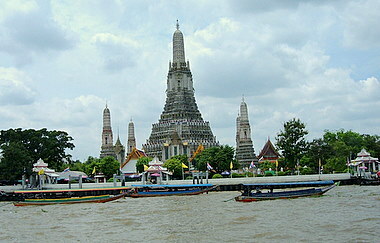 A total of 34 Chao Phraya River piers located along this 25 km winding stretch of river. You don't have to go all the way though, just take your pick and get on and off where you wish. 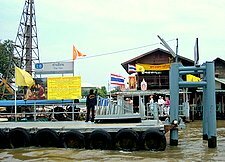 Chao Phraya River ferries provide point-to-point crossings at various piers to help you get to the other side. 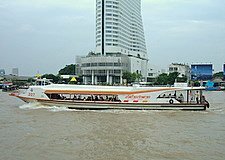 A Bangkok river cruise provides a very different perspective of life in the city on the banks of the Chao Phraya River, an aspect you can't get from the usual Bangkok city tour. Tour Bangkok Legacies – the e-book my Smashwords edition of an-e-guide book for the independent traveller to explore Bangkok.